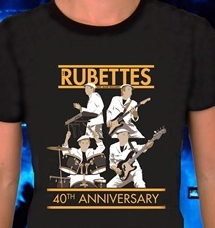 To celebrate the Olympia show and the Rubettes 40th anniversary we have a great new tee shirt that is now available on this site from merchandise. Check out the fantastic new design which was created especially for the guys. The guys leave for their historic show at the Olympia in Paris today and all is set for a great come back in France. After 40 years since their first appearance at this historic theatre they return to celebrate their 40th anniversary and what a fantastic night it will be. The show is now sold out so if you where unable to get a ticket don’t worry I’m sure you tube will show all the action on Monday. We wish the guys a great show and look forward to hearing all those extra French hit’s they don’t normally play and to the surprises that have been promised.